Almost the entire northern hemisphere of Mars is a vast lowland, located over six kilometres below the average altitude of the planet`s southern hemisphere. Over 3.8 billion years ago, there was probably an ocean there, but since then most of the water and atmosphere has escaped into space. Recent research has shown that ice can still be found below the surface in some areas of the region. It is not certain how it got there. Two hypotheses seem to be the most probable: it may be a remnant of the ocean, or the recent, extensive glaciation of the Red Planet. 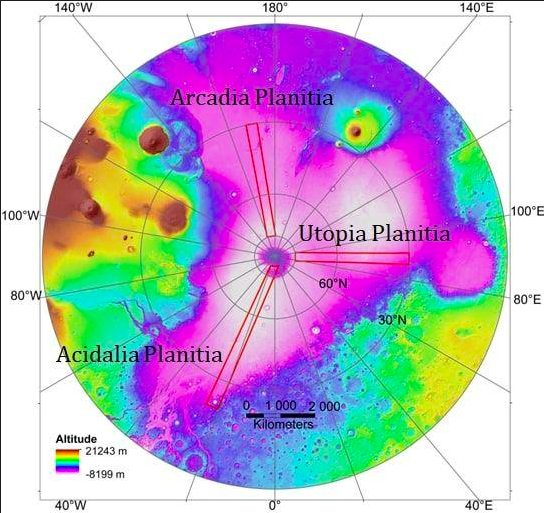 To unravel this mystery, an international team of planetary geologists conducted several years of research into three regions of the North Plains of Mars: Utopia, Acidalia, Arcadia Planitiae. Researchers used data from the American CTX device aboard the Mars Reconnaissance Orbiter, which had been taking pictures of the surface of Mars for several years. The images are made available free of charge by planetary data repositories such as the International Space Science Institute (ISSI). As a result of data analysis and grid mapping, the first such large and detailed map of Mars terrain forms was prepared, explains Dr. Anna Łosiak from the Institute of Geological Sciences PAS and the University of Exeter, who took part in the work of the international team. What are the results of this work? 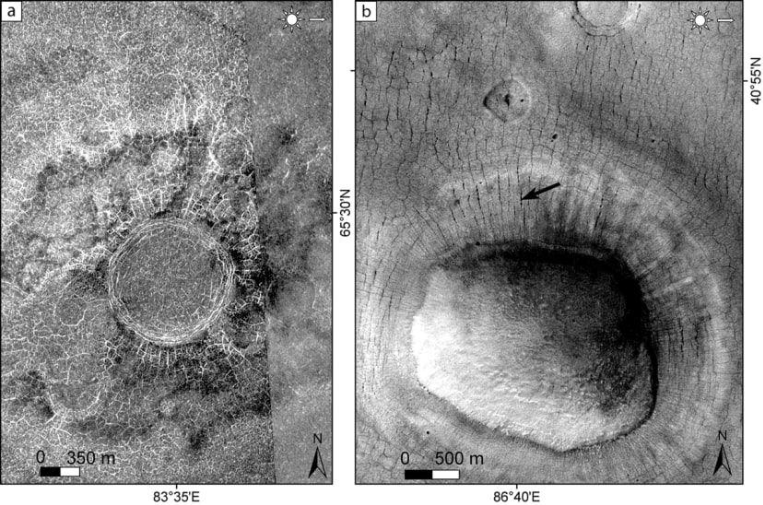 Researchers have identified many places where ice is located just below the surface of Mars, but also those in which it is hidden deep beneath the surface and remains invisible. "We have located terrain forms that show that there is a lot of ice on huge surfaces on the northern plains of the planet, at several dozen meters below the surface" - Dr. Łosiak describes in an interview with PAP. Analyses show that both hypotheses about the origin of ice in this region are true. Most likely, two different types of ice can be found in the North Plains of the Red Planet: ancient, over 3.8 billion years old ice formed as a result of the freezing of the Martian ocean, as well as relatively young, up to several hundred million years old ice deposited as a result of extensive glaciation. The fact that in some places of Mars the ice is just below the surface has been showed not only by the planet surface mapping, but also by the mission of the lander Phoenix, which landed near the north pole of Mars. "The lander had a +paw+, with which it rummaged to get some rock samples. It turned out that in that part, just a few centimetres deep, there was ice" - reminded the researcher. 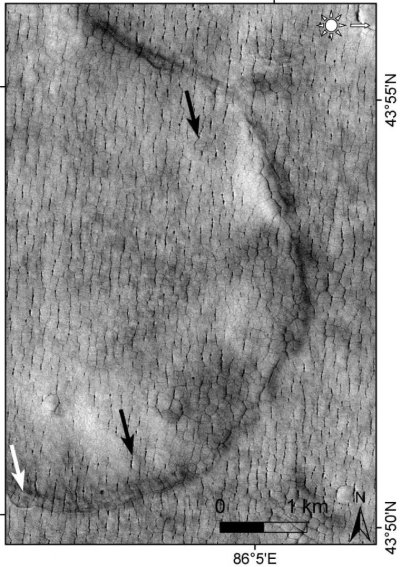 The fact that there was ice a little deeper under the surface of Mars was also indicated by previous radar missions, but those only showed places where there was a lot of ice. Researchers in the described project used terrain forms indicating that there was ice in a given place. An example may be a pingo, a hill several dozen meters high and several hundred meters in diameter, which occurs only in places with ice below the surface. "Geological processes on Earth and Mars are very similar, so if we notice a pingo on the Red Planet, we can be almost sure that there is also ice underneath" - said Dr. Łosiak. The presence of such a large amount of ice, located not only on the poles of Mars, is great news for scientists. It can facilitate the potential colonization of Mars, providing water needed to keep astronauts alive. "When the book +The Martian+ was being written, it was not known that there was so much ice on Mars and it was so easily accessible. Now we know that we do not need dangerous and complicated ways of obtaining water, just step outside the base and dig up this ice" - the researcher believes. In addition, it was previously believed that a Martian base should be established near a large water source. For this reason, poles with ice caps appeared to be the most obvious places. According to Dr. Łosiak, it would not be the best location, also because many places interesting to explore on Mars are in other locations. "If we are attached to one location and one source of water, it makes it difficult for us to do this. But if we know that there is water in many places on almost half of the planet, it will help us plan and extend the possibility of setting up bases in places that are of scientific interest" - describes the researcher. She explains that the North Plains of Mars seem particularly interesting to scientists, because young ice can say a lot about recent climate changes on Mars, and very old ice is one of the best places where potential Martian organisms could have hidden. Studies of three regions of the North Plains of Mars were conducted by scientists from France, Great Britain, Poland, Germany, Canada, and the United States.